Thanks for all of the great comments and love you sent my way in my last post! 105 entries ... wow, I really appreciate all of you that read my blog and give me such great encouragement. So thank you, again. 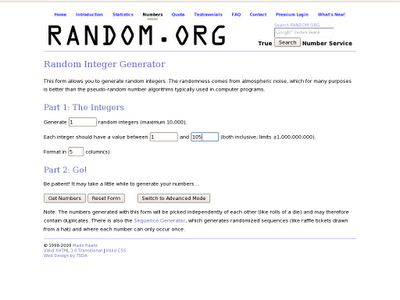 And Mr. Random.org selected #2! The only problem is that there is no email or blog address linked from Leslie's name, so I am not sure how to get a hold of her. Leslie, I hope you are reading this! If so, please leave me a comment or shoot me an email with a way to get in touch with you. If I don't hear from Leslie soon (or if more than one person claims to be Leslie! ... please don't do that), then I have already pulled a backup number. Thanks again, and happy quilting! My spiderweb quilt arrived this week! 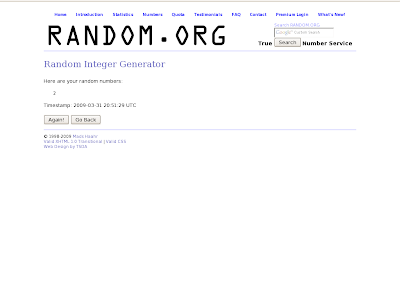 Many thanks once again to both Mary and Jenny for hosting this giveaway. And because I've been on such a lucky streak with giveaways lately, I figured it's time to make a deposit into my karma account. Check back on Monday for a pretty cool announcement and corresponding giveaway of my own. ... my mojo, that is! If you remember, a few posts back I worried that I had lost it. Well, as soon as I got back from my trip to Boston that week, I got to work. I was starting to feel overwhelmed by the ever-growing pile of quilting bee fabric packets that were piling up, so I dove head-first into working on them. And it was just the boost that I needed! 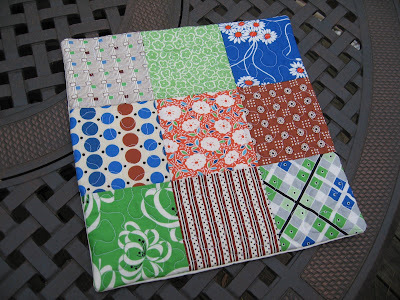 First, in the Cottage Quilting Bee, Nettie from A Quilt is Nice sent a really great and eclectic grouping of fabrics including prints from some of my favorite lines: Lush, Flea Market Fancy, and Mendocino ... along with some coordinating solids and dots. She wanted improv-style blocks in a variety of sizes. I drew my inspiration from Scott's free Woodland Garden pattern that's posted on the Free Spirit site. I have plans to make this entire quilt, so this was a great test run. I decided to finish the block when I got to around 10" x 12" ... I love the rectangular shape. This next block is the block I made for Rachel from p.s. i quilt for the bee inspired group that she hosts, and there's a story behind this one. Rachel requested pinwheels and I was more than happy to oblige. 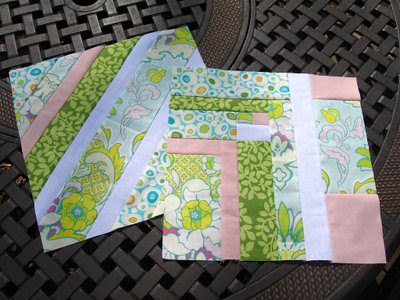 I headed over to Quilter's Cache and started browing the block patterns over there. 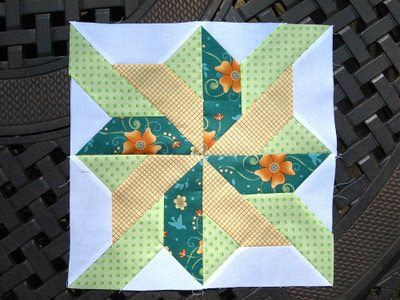 I came across a really sharp looking block called the Whirling Star and thought, "this is it!" It used a template which is a little outside of my comfort zone, but I really wanted to make something special for Rachel so I decided to go for it. Fast forward a few minutes later: I figured out my color and fabric placement, my pieces are all cut, and I start to assemble ... only to realize that the pattern calls for set-in seams. I had never done them before. Actually, let me take that back ... I attempted them once -- that was a complete disaster and I wound up throwing all of the fabric away. Now here I am with someone else's fabric that I hacked to bits, and there was no turning back. I didn't have enough fabric to do anything else. Audrey's block for SewConnected 2 was much more in my comfort zone. 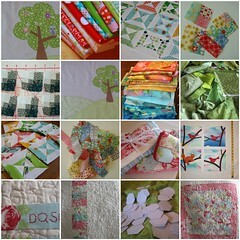 Audrey sent out a really great packet of red, aqua and green fabrics. She wanted blocks inspired by log cabin blocks, and I decided to separate the colors out into two different groupings and mix it up a little bit. I was definitely inspired by Rita's block from a few months back. 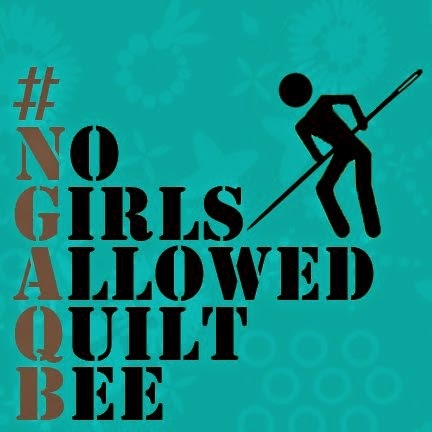 Finally, this was the inaugural month for SewConnected 3, another virtual quilting bee with a new group of 18 fabulous quilters. With so many people, this isthe first of the SewConnected groups that will have some months where we make blocks for two different people. March was one of those months. 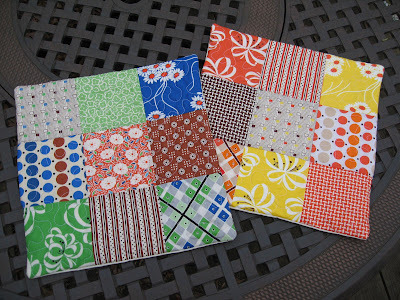 These first blocks are for Saranya (sew-do-I) from Thailand. Her fabric selection was so inspiring that I couldn't stop at just one block! 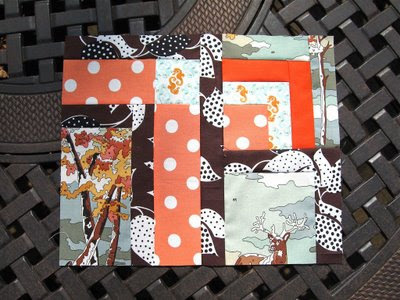 For this first block I once again turned to Scott's Woodland Wonderland pattern. That's where the part of the block to the left of the white bar comes from. 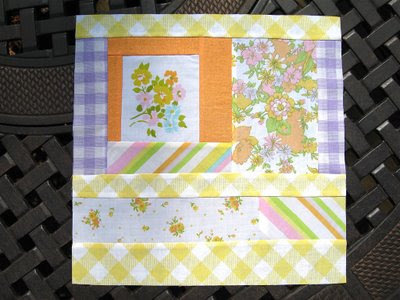 To make it 12" square, I decided to feature the Heather Bailey "Pop Garden" flower on the right. I used the basic principles of string blocks to make this 12" square featuring basic diaginal strips. 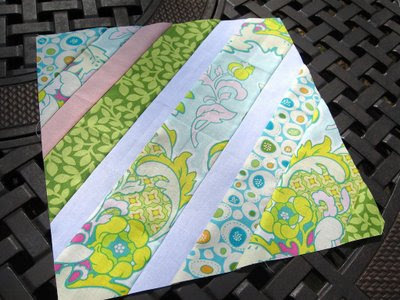 I loved all of these fabrics so much that I really wanted to feature them and not cut them up into little pieces. I love this simplicity of this block. Saranya really chose wonderful fabrics. And last but not least, a block for Donna (rocklilly) from the Sydney, Australia. 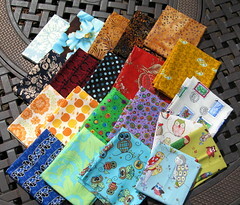 I know I sound like a broken record, but Donna too sent a very inspired grouping of fabrics. That's been my favorite part of joining these quilting bees (and why some might say I'm addicted): ogling over everyone else's unique but amazing fabric combinations and actually getting to work with selections that I might never have put together myself. The idea for Donna's block really started with that chain-like piece down the left side. I've really been wanting to make something like that ever seeing similar patterns from Jacquie and others. I added the mermaids next because (and this may sound cheesy), it seemed to me that the chain could be an anchor chain dropping down from a boat, and the mermaids, turtles and octopi are swimming up and around the chain. 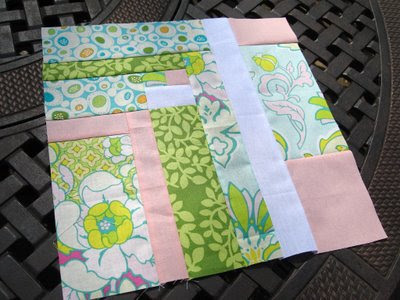 Anyhow, I just free / improv - pieced the rest of the block from there. Whew! Enough for one post? I'm excited to report back next month because it's the first time that it will actually be my month in one of the quilting bees! 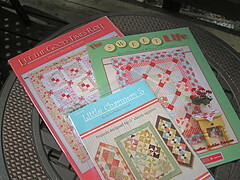 I'm excited to see what I get from all of the other amazing quilters. I WON A SPIDERWEB QUILT! 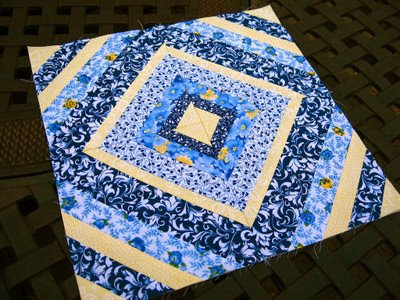 Mary, who blogs over at The Momoo, hosted a giveaway and the grand prize was this beautiful quilt. These spiderweb quilts are popping up all over the web and, as much as I love them, I didn't have any plans of undertaking a project of this scope on my own ... especially still being a paper-piecing virgin and all. So I'm choosing to believe that it was fate that my number would be pulled to win this masterpiece! 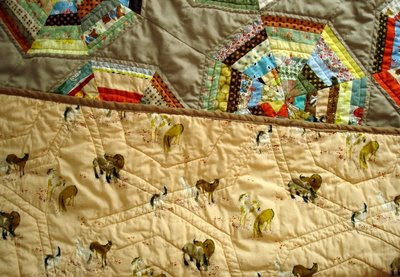 This quilt was actually made by Mary's uber-talented daughter, Jenny blempgorf. Every time I look at the pictures I get even more excited; first, because I keep seeing more and more of my favorite fabrics that I've never had the pleasure of working with (I'm lookin' at you, Mr. Heather Ross gnome, and those rare Flea Market Fancy prints), and also because the choice of the soft tan rather than stark white is so my style. And check out the backing fabric. My daughters will absolutely LOVE the horses! This quilt will live such a happy life in our home. Mary and Jenny, thank you both so much -- I promise that this quilt will be loved and cherished. Please take a moment to check out Mary's blog and say "hello" for me! 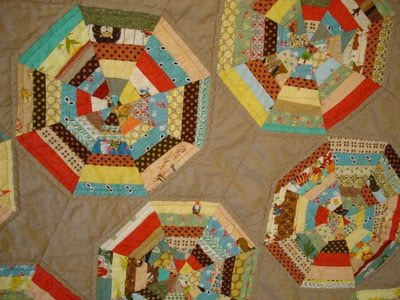 Run, don't walk, over to Quilt Arts online. They are having a 50% off sale. Yes, that's right ... 50% off all fabric! And all the top designers -- Amy, Joel, Kaffe, Heather, Denyse, Tina, Sandy, and more. Kokka and Japanese fabrics, too. Fat quarters are only $1.25 ... WHAT??!! And yes, they do have the coveted rocketship fabric that I've featured here on my blog a few times. Thanks to Flickr pal lharsma for the tip! 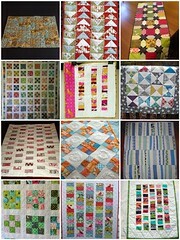 Several DQS6 swappers are making great progress already on their quilts for their partners. Lots of great sharing and discussions over at the Flickr site, inspired (and inspiring!) fabric choices, and ingenious designs keep popping up. These photos may or may not be from the people in my group ... I've got to keep you guessing!! I am still trying to decide what to make for my DQS6 partner. This is a mash-up of some of his / her favorites and some of my favorites. I need help not only with the pattern idea, but with the fabrics as well. I am deciding between the new "Fresh" line and the new "Soiree" line, both by Moda. So help me envision something ... pattern + fabric combos ... any thoughts?? This print is called "Bridget" and is was part of the Girlfriends collection by Sis Boom for Free Spirit fabrics. This was one of, if not the first quilting fabric that my wife purchased when she first got her sewing machine. She made some really great bags with it. 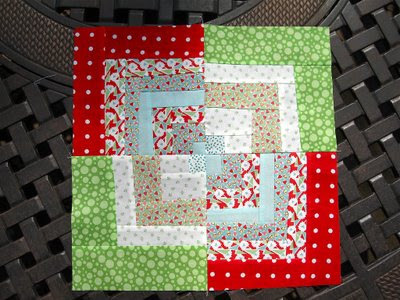 There's even a baby blanket made from this print featured in the Last Minute Patchwork + Quilted Gifts book. I've always loved this fabric. I started getting into quilting right around the time this line was discontinued, so I've been hoarding this fabric every chance I get. It remains one of my absolute faves. I still have a pretty sizable cut of it, along with some of the blue and green versions that I found on eBay. So why am I sharing this today? 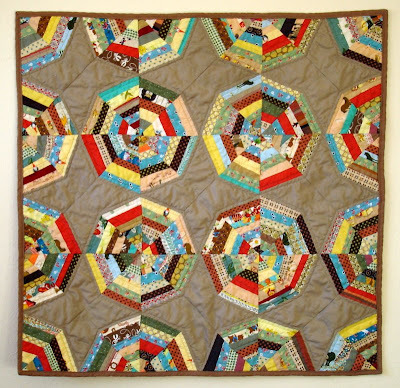 Well, because quilting bro Scott over at Blue Nickel Studios recently posted a really fun interview with its designer, Jennifer Paganelli of Sis Boom. And, you guessed it, there's a giveaway involved!! 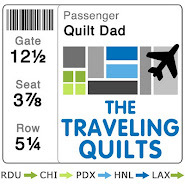 Go check it out and tell him Quilt Dad sent'cha! Yes, I realize that it's March 12th and I am just now posting about a January swap. Remember my last post when I said things have gotten a little out of hand? Well, it hasn't gotten any better! Remember when Austin Powers lost his mojo? That's kind of how I feel right now. I haven't sewn a thing in over two weeks -- unfortunately, sometimes quilting has to take a back seat to higher priorities, like my family and my job. In fact, I'm writing this post from a hotel room in Boston, where I'm traveling for business! I'm still dealing with IT issues at home, but (cue angels singing) I finally got my MacBook! I just got it and I'm still learning how to use it, but I LOOOOVE it. I am so excited. And the other good news is that one of my teammates at work was able to save all of my files from my old computer. I'm still working on transferring everything over to the MacBook, but I am just so relieved that my music collection and my family photos are not lost and gone forever. OK, so back to the swap. 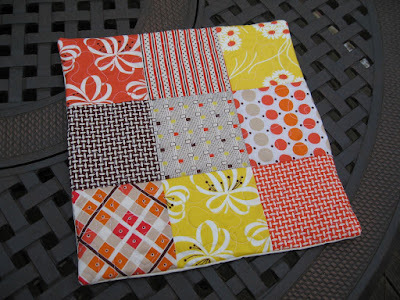 In January, Solidia and I were paired to make "plain jane" quilts in the Swap 'Til You Drop mini quilt swap. Solidia actually sent me a mini quilt once before, for my very first mini swap quilt ever back in July! As much as I love that quilt, Solidia outdid herself this time. 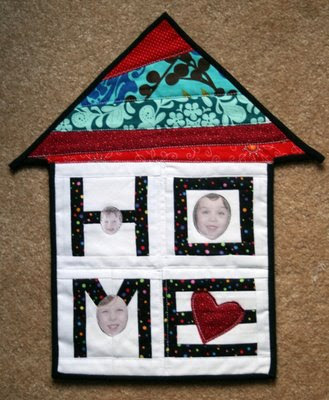 Isn't this such a great little quilt?? (The image is actually taken from Solidia's photostream ... I'm still not able to download photos from my camera to my computer). Solidia incorporated pictures of my three children into the design. I love it, Solidia ... thanks so much! I am glad we'll be swapping some more in SewConnected 3! Just in time for Valentine's Day, I sent Solidia this 12"x12" quilt in shades of red, pink, and chocolate brown and an with all-over stippling design. I hope you liked it, Solidia!! I've got lots and lots to finish up this month, and I can't believe March is almost halfway over already. I hope I get my mojo back ... soon!! When I first became interested in quilting, one of the books that I picked up was the Modern Quilt Workshop, and one of my favorite quilts in that book is the "jigsaw puzzle" quilt (also featured on the cover). 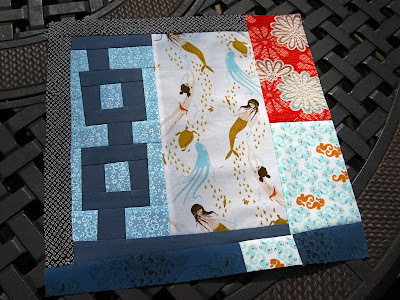 I decided to use that quilt as inspiration for Stefanie's block. I loved working with the solids and playing around with their placement. I can't wait to see her quilt after it's assembled! In the SewConnected 2 group, resident monkey Katy wanted traditional(-ish) blocks made from an array of Liberty fabrics (quite fitting for our UK-based member!) I received several different cuts of some of the most striking and original prints that I've ever seen, along with some plain linen for contrast. For my second block, I went somewhat less traditional with this block of my own design. Unfortunately, the pictures don't do the fabrics any justice. I love the flowers in blues and khakis, as well as the paisleys that I used around the edges. For contrast, I used a khaki-colored Kona solid. It's actually a pattern resembling four quarter-log cabin blocks. I know the pattern gets lost with all of the different prints going on, but I kind of like its craziness. At this point I still wasn't out of fabric and couldn't resist starting a fourth. I didn't want a single scrap to go to waste! I decided to make another "X" block, but replacing the khaki with a solid pale blue (also Kona) that matched the blue of the Liberty fabric perfectly. At this point, I actually did come up a bit short. If Katy likes this block (and I hope she does! ), she'll need to add the final border from her stash. Next month: SewConnected 3 gets off the ground! !